Pitch Black 2015: And the Winners Are . 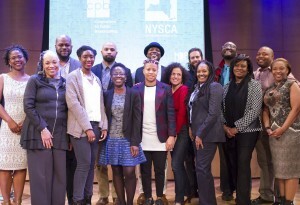 . .
Last Thursday, April 23, the eight final teams from this year’s NBPC 360 incubator took the stage at the Jerome L. Greene Performance Space in downtown Manhattan. The producers had spent six weeks honing presentations for this special event: Pitch Black, an evening that spotlighted their ideas in front of a live audience and a panel of industry professionals. NBPC 360 teams who presented pitches for interactive web projects pose with mentors, NBPC staff and panel moderator Sandy Rattley. 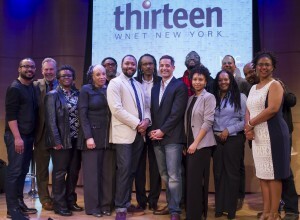 We at the National Black Programming Consortium are proud to announce that the pitches for all eight projects — The Life’s Essentials Docuseries, My Africa Is, The Newark Project, Street Cred, Black Broadway on U, CHRONICLE: The Other Walter White, Pixie Dust and POPS — lit up the room more brightly than all the flashes from photographers’ cameras. Each team delivered with visible passion and contagious energy. And when they weren’t pitching, they were clapping and cheering for other presenters. Despite the spirit of fellowship that night, Pitch Black was still a competition, and only a few producing teams could receive funding of between $50,000 and $150,000 for their pilot episodes. Based on the deliberations of six industry panelists that night — PBS’s Kathryn Lo, Vital Pictures’s Llewellyn Smith, WBGH-TV’s Liz Cheng, ITVS’s Karim Ahmad, PBS’s Nicole Eley-Carr and filmmaker/producer Topper Carew — NBPC has chosen four finalists for funding. Street Cred — an Apprentice-style show by Detroit native Sultan Sharrief — puts an inspirational twist on the reality genre by focusing on the empowerment and potential of Detroit high schoolers as they learn producing skills to compete for a dream internship. POPS — a web series on black fatherhood by 180 Days director Garland McLaurin — celebrates African American dads from a variety of socioeconomic backgrounds and documents their day-to-day dealings with their children. My Africa Is — a documentary series who project team includes producers Nosarieme Garrick and Hassatou Diallo — challenges mainstream media depictions of Africa by spending time with young African innovators as they pursue community-minded enterprises, such as floating schools and printers made from electronic waste. Pixie Dust — an urban fantasy web series by storyteller Damon Colquhoun — follows a teenage girl who discovers magical powers as she struggles to get along with, and take care of, her mentally ill mother. Teams who pitched projects for broadcast gather onstage with mentors, moderator and NBPC staff. The performances of all eight teams who took the stage at Pitch Black are testimony to how much they have developed, as producers and as friends. Hassatou Diallo of My Africa Is had this to say of her experience in the incubator: “NBPC 360 is an awesome program, especially for producers of color to get feedback on their ideas. If the NBPC 360 fellows can accomplish this much in just six short weeks, we have no doubt that the future for them, and for their projects, will be full of opportunities. Previous StoryThe 180 Days Game Is Here! Next StoryHow Far Would Your Mother Go to Save You from HIV?